The Stormcast Eternals looked around them at each other. They all felt a void between them. Something had disrupted their connection with the Source. One of the Judicators in Skratgorath saw motion first, a dust cloud on the horizon. His keen eyes made out forms moving quickly through the flaky dust. The Sigmarites had been stationed on Skratgorath and in Evenheim, on each side of a Realmgate. In Evenheim an ancient evil lurked beneath the serene woodlands, its poison keeping the area around the Realmgate dead but still imprisoned. 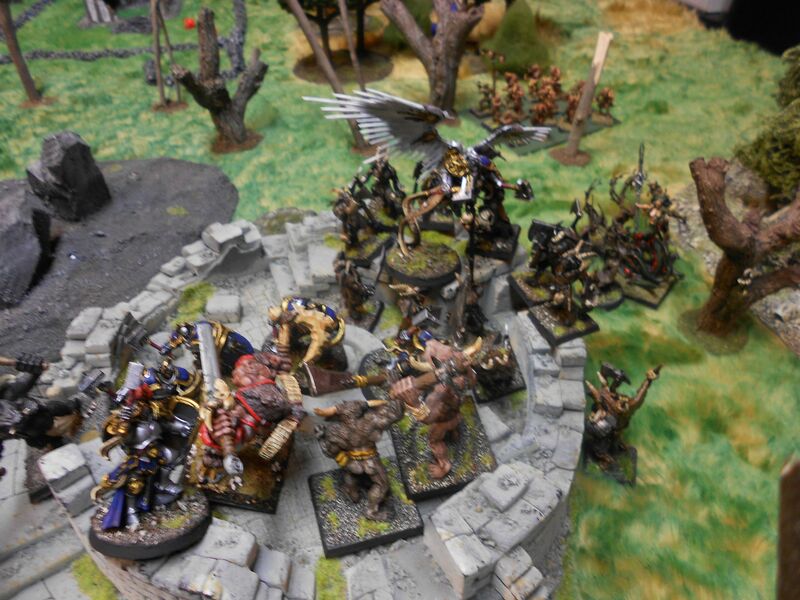 Prosecutors then saw movement in the Evenheim woods and Lord Relictor Dangar Raneskjold called out for help from Lord Sigmar. But nothing came. He felt the disturbance when the others had felt it too. Now he knew what it was. 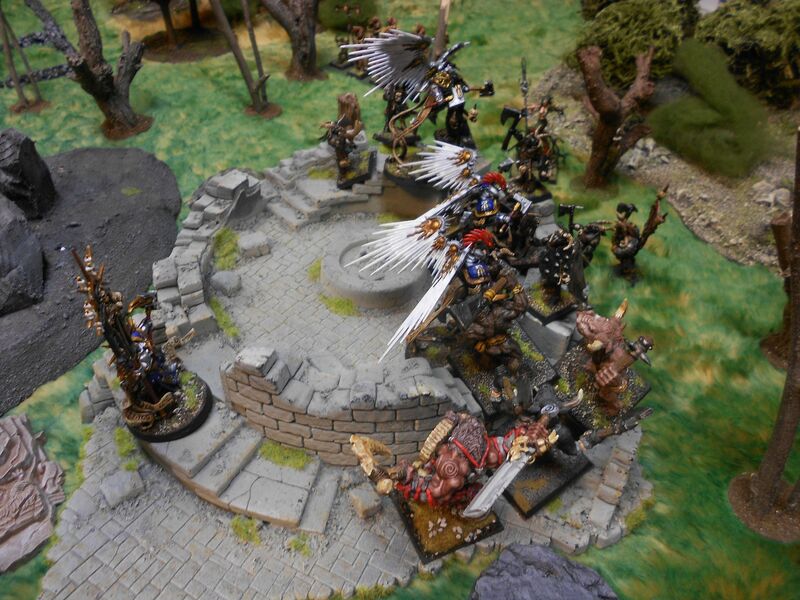 Chaos had weaved an arcane dome about the Realmgates from both sides, it disrupted the bond between Sigmar and his servants. He could sense some weaknesses in it though and while it was slowly pulling apart the Eternals it was also weakening. The forces of Chaos must have known this too as they were streaking towards their adversaries with imagined speed. They fell upon their adversaries, daemons screaming out of thin air, trailing a soporific musk behind them as they leaped onto the battlements, their savage claws tearing at the Judicators. Only one volley of arrows had fallen among the advancing Chaos hordes before the Judicators were beset by the hermaphroditic monsters. 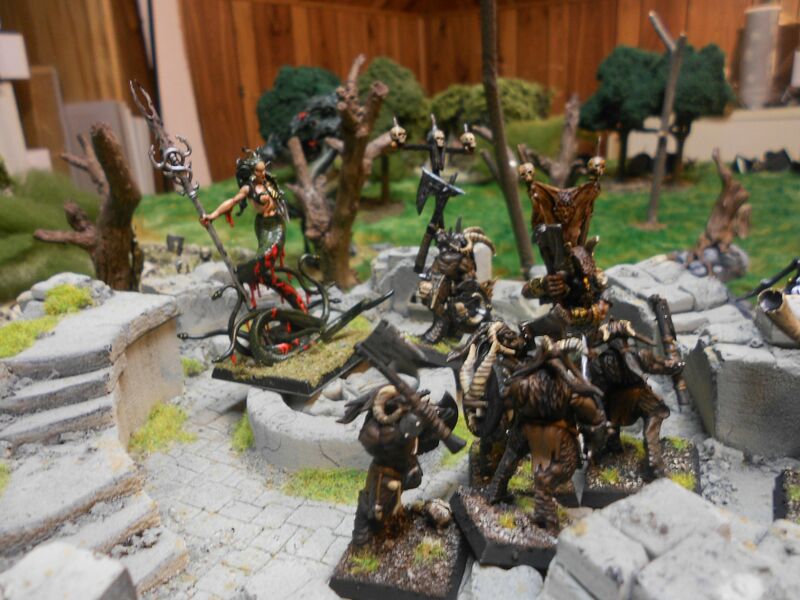 On the Evenheim side of the gate the Prosecutors fared no better, being caught between Beastmen Gors on the one side and Minotaurs on the other. 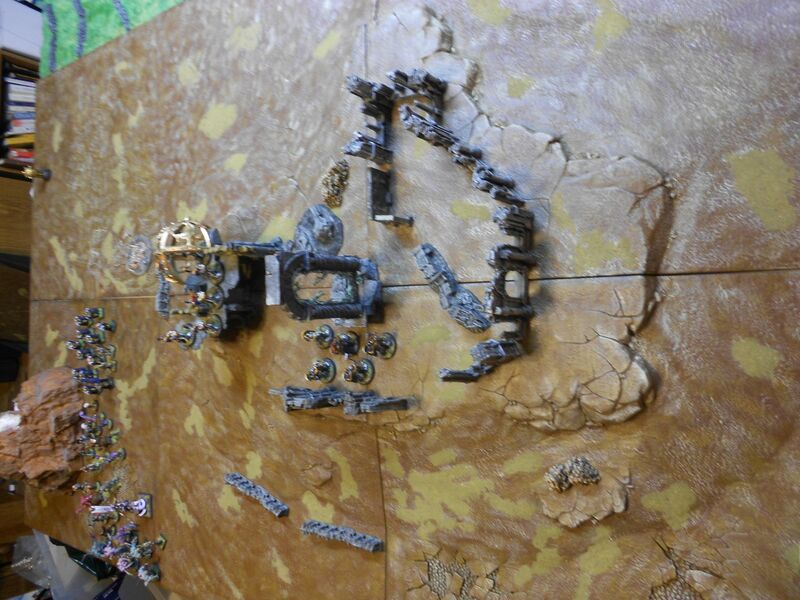 The Chaos forces swept around the ruins of Calsbath Keep and moved towards the Realgate, the Liberators stepped up to keep them from their objective. Raneskjold could see that if he did not act quickly all would be lost. 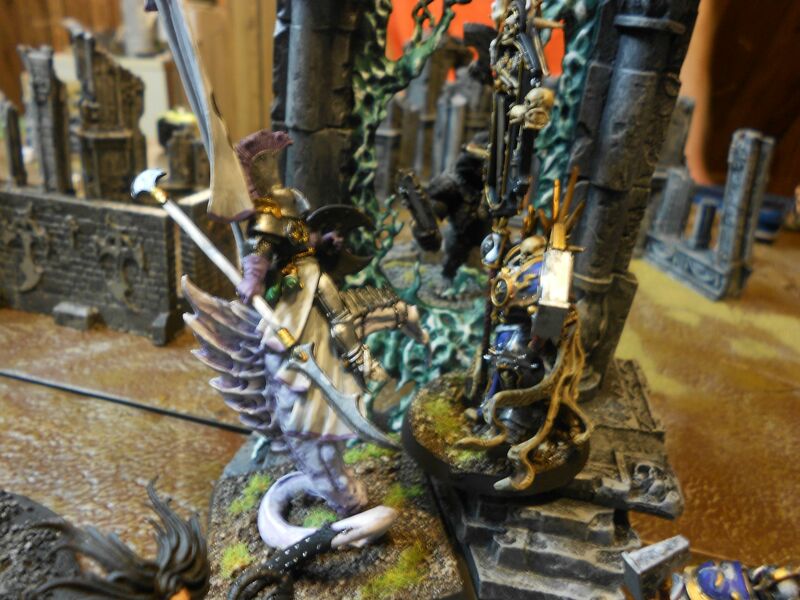 There was a Slaaneshi champion moving among the beastmen, it was his guess that the Beastmen were just pawns getting the the decadent followers of the Hidden God to their objective. He knew the danger that lurked beneath their feet, if he couldn't stop the Dark Prince's minions the forests of Evenheim would soon resemble the razed plains of Skratgorath. 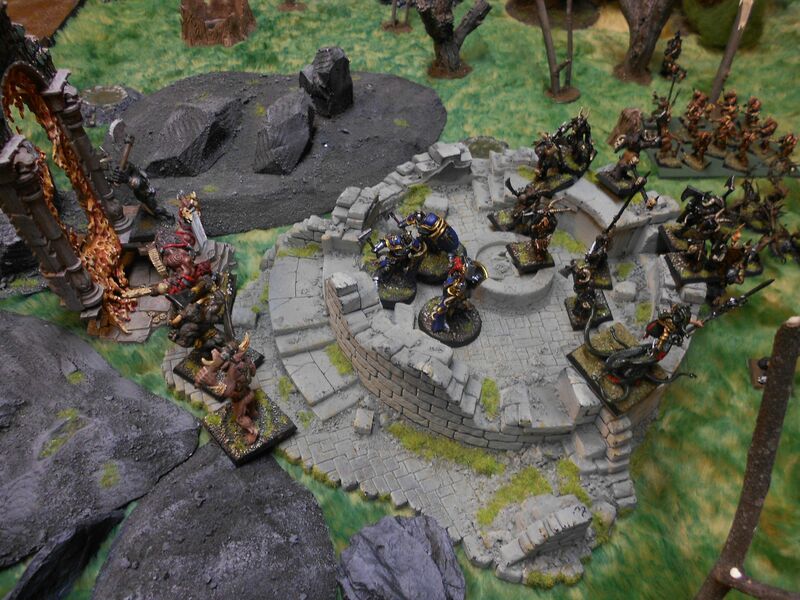 He concentrated and shut out the noise of battle around him, he shut out the astral winds bleeding through the Realmgate and with his will he pierced the dome the Chaos magic had placed over them, in a flash of lightning, 5 mighty Champions of Sigmar stood just outside the ruined tower, the burial site of Traumire. With the chaos forces momentarily checked here he moved back through the gate to hold up any advance on the other side. 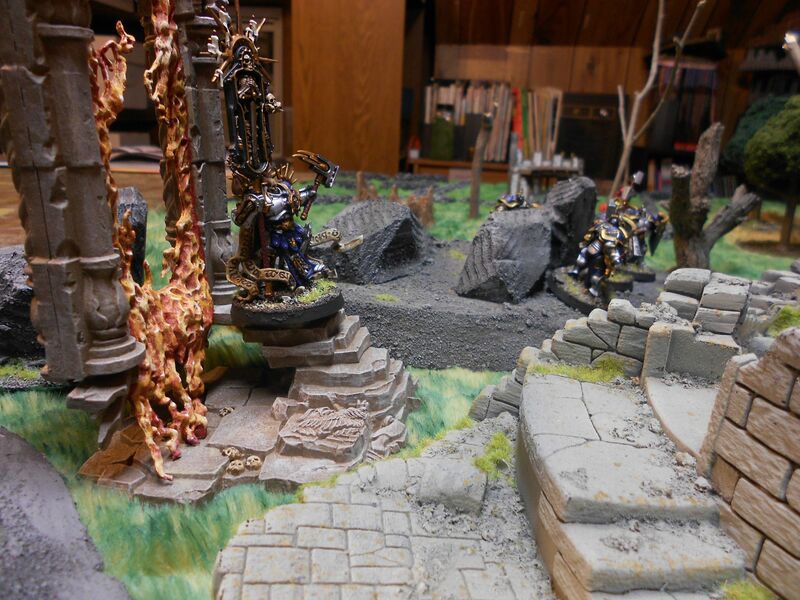 The Liberators paused to watch the Lord Relictor go and saluted him as he left, their hammers raised, before charging forward and into the ranks of the beastmen. The forest itself had come alive to stop the destruction intended by the dark powers. 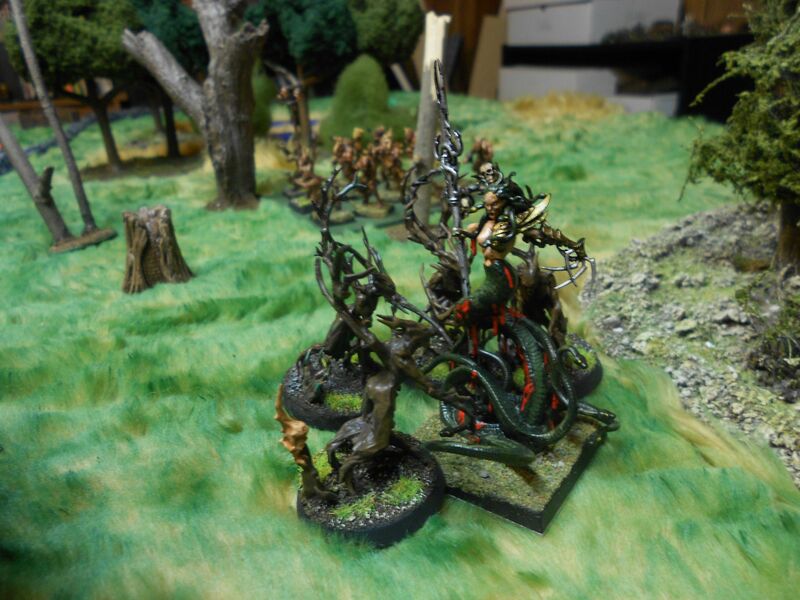 Dryads rushed out to block the path of the Slaaneshi Champion, but she was too quick, and with only a minor scratch, slithered away from their grasp. 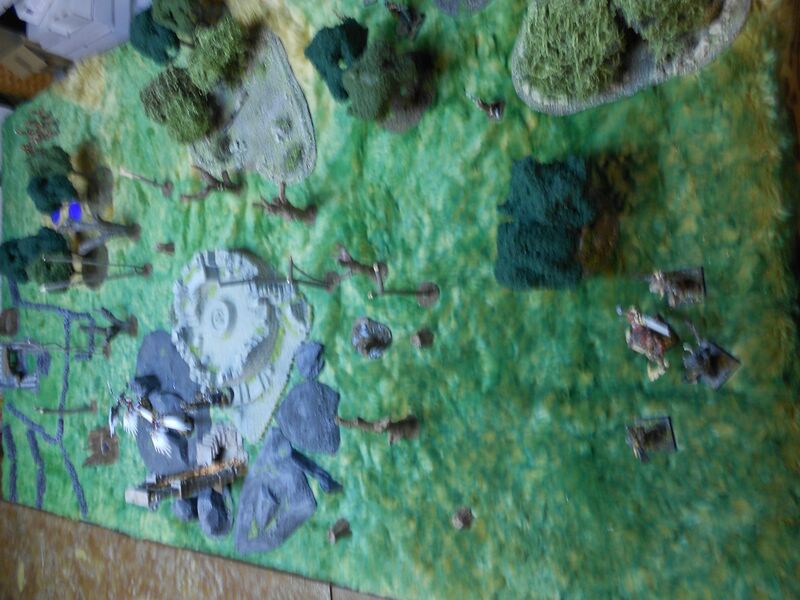 The Dryads were going to pursue but Ungor warriors attacked them, their daggers stabbing into the wooden limbs of the guardians of the forest. 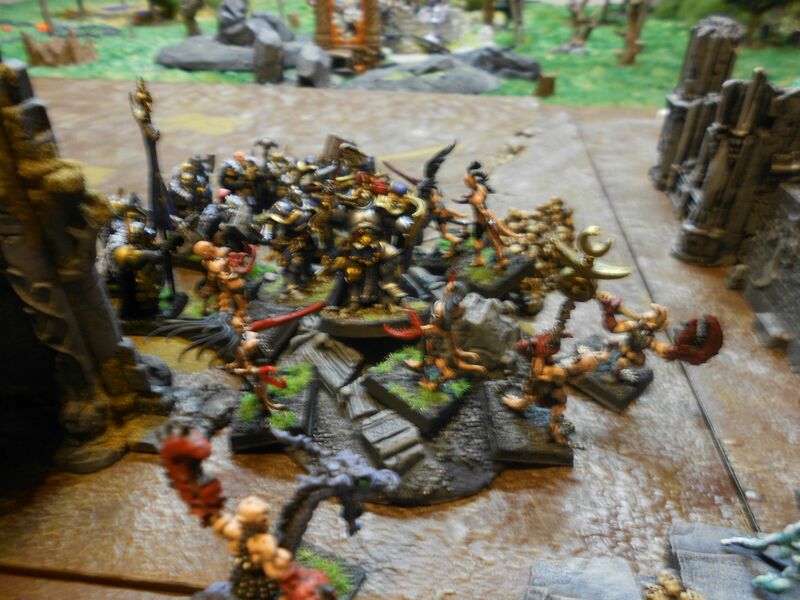 As the last of the Prosecutors fell beneath the axes of the Gors, the Minotaurs pulled away from the Liberators and plunged through the Realmgate in pursuit of the Lord Relictor. 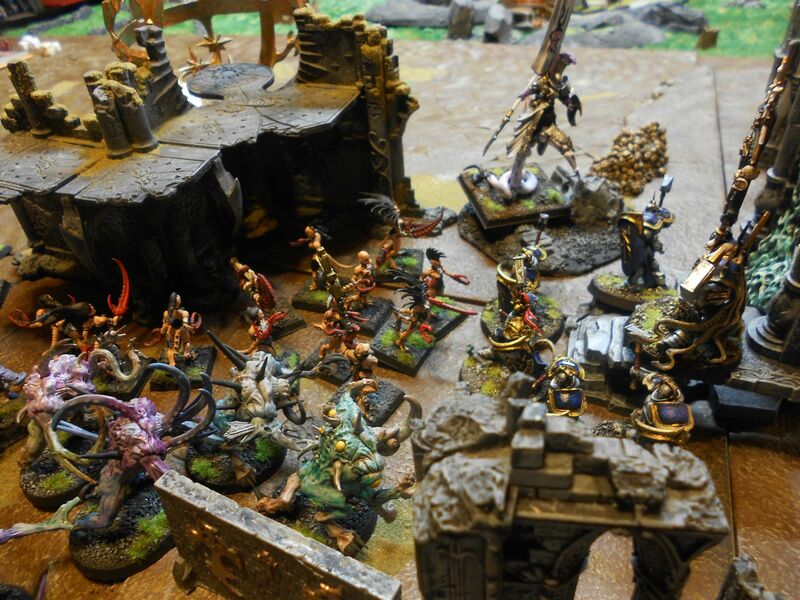 The combat in Skratgoranth was vicious as the forces of Slaanesh tried to plow their way through the last of the Sigmarites and make it through the realmgate, but Raneskjold and his Liberators stood firm, holding off assaults from both front and rear, from Daemon, mortal and beastman alike. Eventually the attacks wore at them. Razor claws tore pieces of armour away and then pierced the flesh underneath, blades slashed with inhuman speed, cutting through defensive moves to parry. As the last of the Liberators fell the Lord Relictor, assaulted from the front and back used all of his energy and again managed to break through the arcane dome blocking his full communion with his God. Lightning cracked for the first time on this side of the Realmgate and five more Liberators stood, ready to face the Chaos hordes. It was the last thing Raneskjold would do. 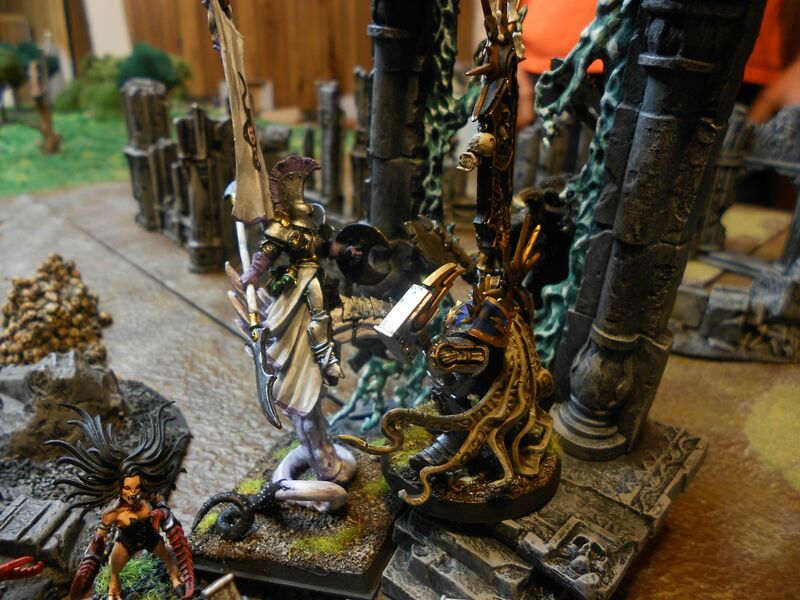 The glaive of the Slaaneshi lord moved again in an arc too fast to see and sliced off the head of the Stormcast hero. The Liberators are quickly beset from all sides. 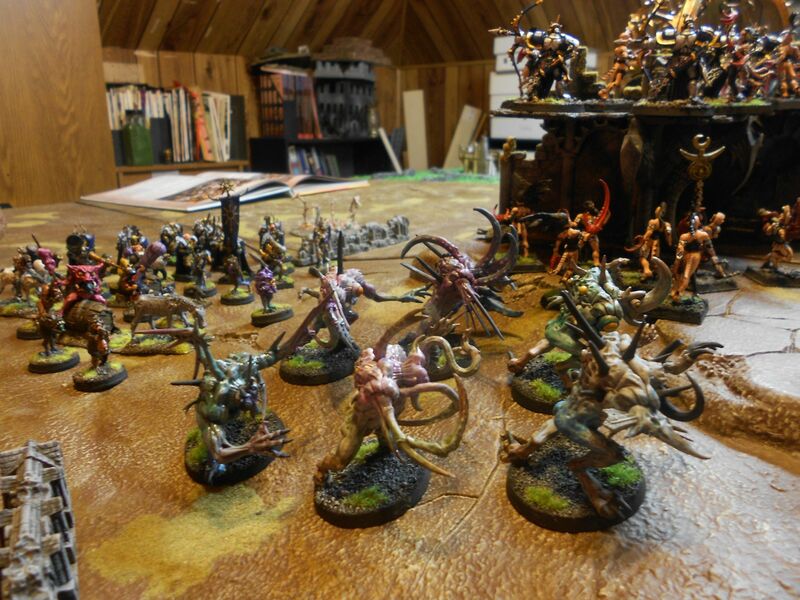 And the champions of Chaos run through the gate to aid in the ritual already taking place on the other side. But they are too late. The protective arcane dome collapses around them, the skies darken over Evenheim and lightning bolts flash all around them, illuminating the forest. 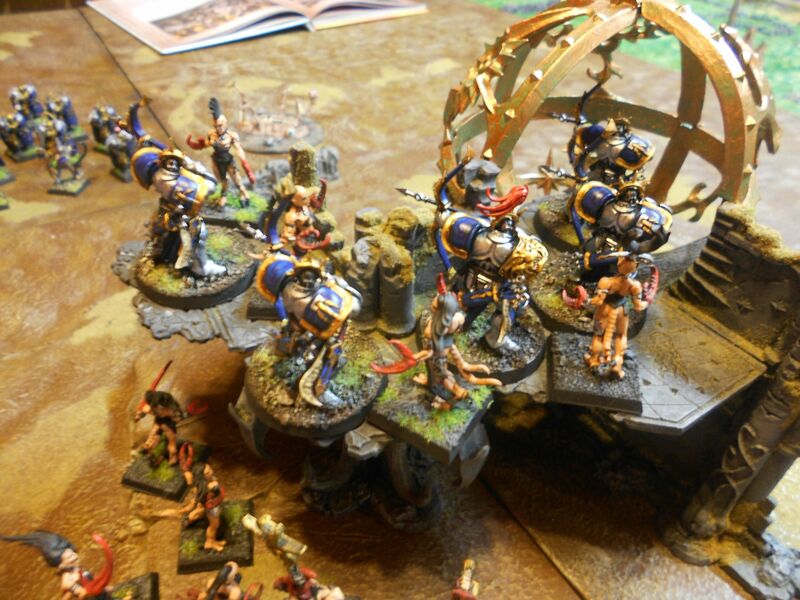 Slowly the ground rumbles and beastmen and Slaaneshi champion are alike thrown aside as the earth explodes. Traumire has awakened. 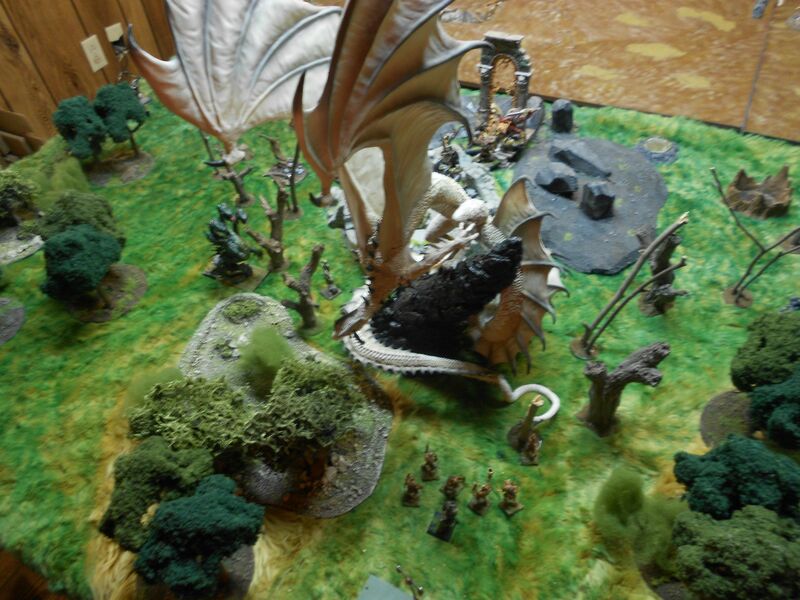 Through the woods the newly arrived Sigmarites can see the terrible form of the dragon as it arises, angry, from the ground, the head peering about it to determine which of the various small moving creatures will be its first meal. Very kewl…I like the idea of playing both side of a Dimensional Gate at the same time. As always, superb narration and story! Like I've said, for those who have bashed AOS and disregarded it, YOU prove again and again that Warhammer is about immersion and story and not about stat-crunching and winning with spreadsheets. This is Warhammer idealized and it is exactly how I approach my games as well. Well, thank you very much. I'm glad you like the reports. I'll keep them coming. The second part of this will be gamed later this afternoon actually. I think all gaming is about immersion and story. I have been doing mostly historicals for about the past 10 years or so with the odd Infinity, 40K or Dropzone Commander game here and there, but AoS really brought me back into high fantasy gaming. Warmaster was great for that too as it didn't deal with the fiddly bits even if it was point based. 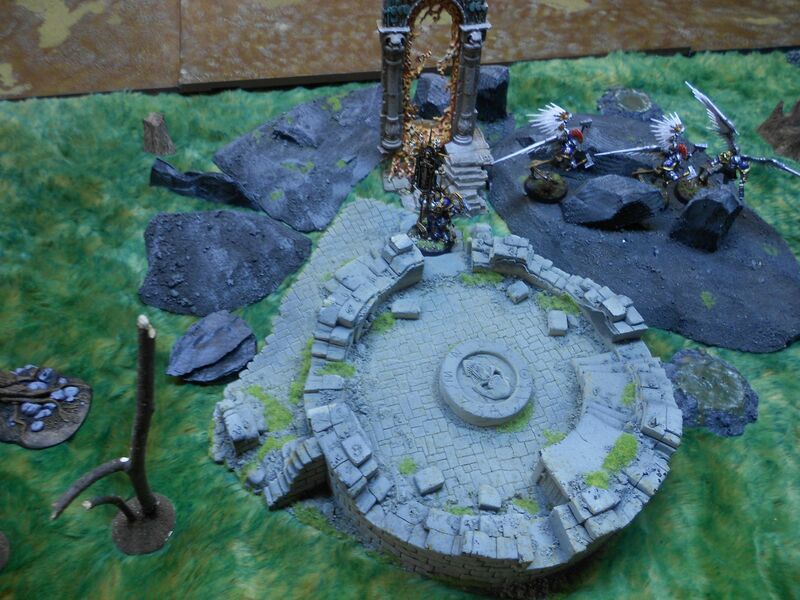 Pictors, who makes those ruins in the first pic on the left? 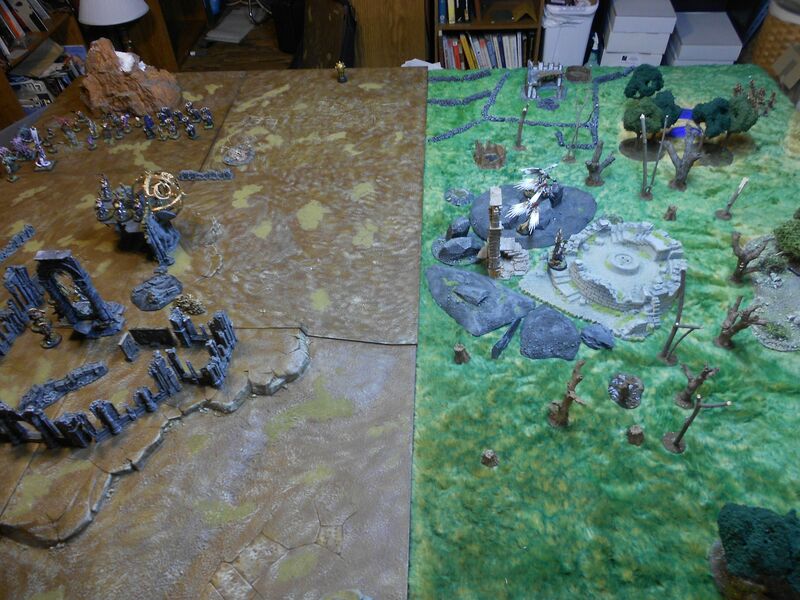 cool terrain.